We're sorry, but space Professional boardroom for all your meetings in the heart of The Hague is no longer available. 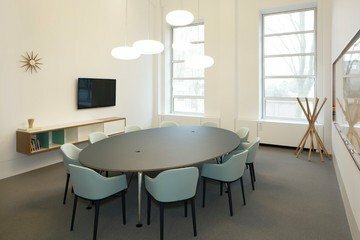 This meeting room in The Hague with plasma screen and whiteboard has everything it takes for you to come up with amazing ideas and just be creative. The round table setting stimulates a common approach of your agenda while you enjoy a cup of fresh coffee. This room is suitable for 10 people.